Facebook’s much awaited Places product finally launched this week. It’s the first step toward bringing friend finding to the masses. People have been using Facebook to do this for years; posting their location in freeform status updates that their friends can read and comment on. (e.g. “heading to Cambridge for dinner.”) By turning that freeform text into structured location data, Facebook can make that data more useful. From an iPhone or HTML5-capable mobile device, you can check in to a place, such as a restaurant, bar, movie theater, airport. You can also leave a message with the check in. The check in is posted to your wall and may appears in friends’ news feeds. On the mobile side, you can see a list of your friends and where they’ve checked in. Clicking on a place will show you details of the place, including a map and who has checked in. The initial release is fairly simple. In fact, it’s not that much more useful than the freeform status updates. Facebook is entering a very crowded space with competitors such as foursquare, Gowalla, Loopt, Google Latitude, Whrrl and Twitter. Many of those products are much more robust. 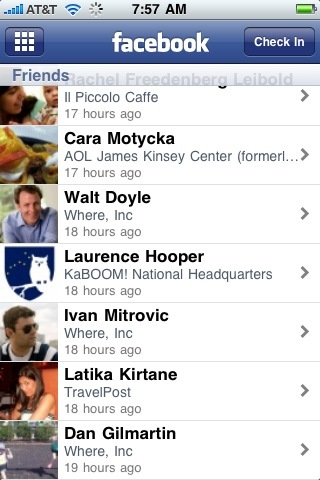 Facebook’s key advantage is the size of its social graph: within the past 24 hours, 18 of my friends have checked in. Basic UI. Check ins are sorted by time, not distance. A friend checking in 2,000 miles away 2 minutes ago is less relevant than someone checking in 2 miles away 5 minutes ago. This problem is exacerbated by the fact that the city isn’t shown. Considering that many people use Facebook to keep track of friends all around the world, this is a significant issue. Foursquare has a separate bucket of “Friends in other cities.” Update: Facebook now has a separate grouping of nearby friends. Map view. Often, visualizing your friends on a map is much easier than scanning a list. Foursquare already offers this. Visiting friends. Out of town friends who are in town aren’t indicated. One of the big potential values of social friend finding is discovering when friends are in town. If a friend from far away is visiting, I’m more inclined to want to get together than someone who lives in town. Pictures. There is no way to associate a picture with a check in. Given the difficulty in typing on mobile devices, often a picture gives a lot more information. These pictures could also be used to build a much more robust Place page. Pushing location. Sending people your location via SMS is tedious. You have to address the message, type out where you are. If they don’t know where it is, they have to pull up a map or text you back for directions. With Places, it would be easy to push a notification to friends with where you are, complete with map. This could be sent as a push notification on iPhones or as an SMS with a URL for other phones. As with most Facebook product launches, questions of privacy come up. In general, I think Facebook has done a good job with the default privacy settings on Places. You must explicitly check in; there is no background tracking. Only your friends can see where you’ve checked in. Unfortunately, my social graph on Facebook wasn’t designed with location in mind. When I decided whether or not to accept friend requests on foursquare, I used a tighter filter than on Facebook. Now, I’ll have to go back through Facebook friends and create a list of who should have access to location. (See Post technology columnist Rob Pegoraro’s piece on how he classifies his friends.) Yes, old high school friends have been known to burgle homes based on Facebook updates. If that worries you, watch Rob’s video on how to adjust your privacy settings for Places. The one big complaint I have with the privacy defaults is that your friends can check you into a location without your permission. This entry was posted in facebook, foursquare, geotagging, lbs, maps, mobile, twitter, wireless and tagged export. Bookmark the permalink. Might be new (cos you know how FB releases something then updates it on the fly), but you *can* disable the function that allows other people to Placebook you. Doesn’t stop ’em from tagging you in a status update, tho — as far as I can see. Yes, you can turn it off. But the default state is that people can check you in. I haven’t seen the option. How do I access this? Brittany – It happens automatically for me.